Shape into 30 (1-inch) and 60 (3/4-inch) balls. Roll in sugar. For each snowman, on ungreased baking sheet, place 1 (1-inch) ball and 2 (3/4-inch) balls, with edges just touching. Place snowmen 2 inches apart. Insert 2 pretzel sticks for arms, 2 cinnamon candies for buttons. Bake 7 to 8 minutes or until light golden brown. Immediately place 1 HERSHEY’S® Kisses® brand milk chocolate for hat, 2 HERSHEY’S® mini semi-sweet chocolate chips for eyes, 1 orange triangle for nose. Cool 5 minutes; carefully remove from baking sheet to cooling rack. Cool 30 minutes. Stir frosting and food colour until well blended. Place in small resealable freezer plastic bag; seal bag. Cut small tip from one corner; squeeze to pipe scarf. Let your little elves personalize these fun cookies with different candies and colours! Use 2 different-sized cookie scoops to make portioning cookie dough even faster and more consistent. Making and baking snowmen in batches of 6 gives time to complete the decorating process easily. 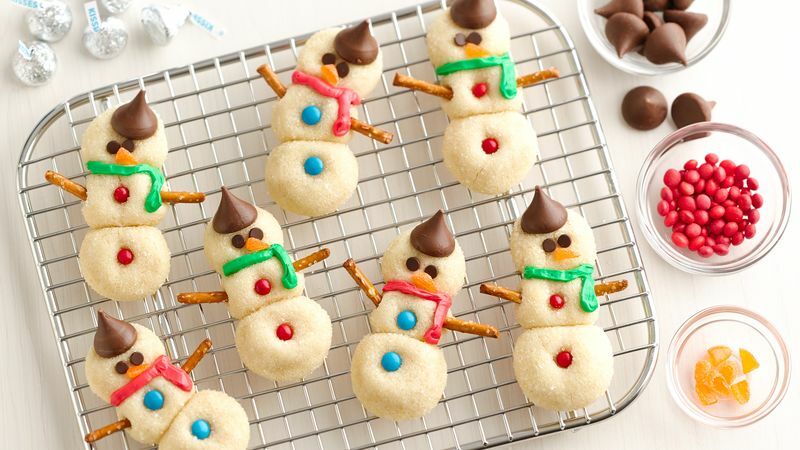 Place HERSHEY’S® Kisses® brand milk chocolates on top of snowman, and let melt into cookie. Make sure candy is attached before moving snowman! If not, let cool a few minutes longer. If desired, use Mini M&M's™ chocolate candies instead of red cinnamon candies. Or make some of each!